Adler Group and 13th Floor Investments have increased the size of their massive $600 million Link at Douglas project. It is now set to become one of the biggest developments in Miami’s history. Earlier this month, the Herald reported that many residents and politicians were caught off guard by an August TNM report of a 40-story tower planned for the site. 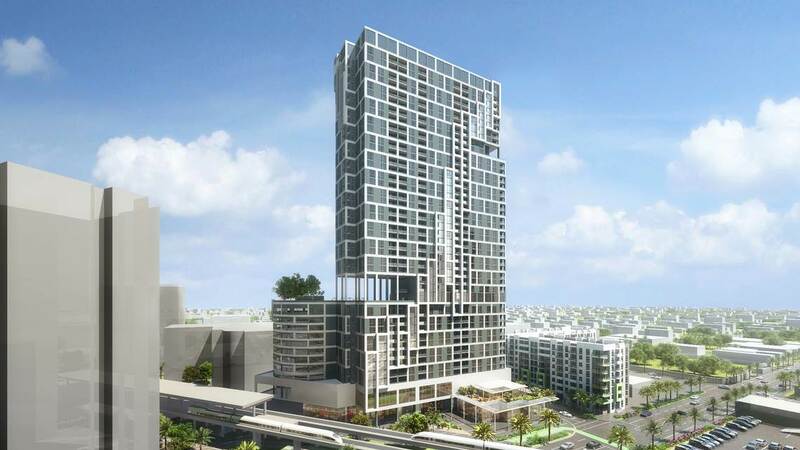 Some residents have complained that the proposed building is too tall for the area (Miami-Dade is overseeing approval with no oversight from area municipalities). The developers told The Next Miami in August that phase 1A, which includes a 22-story office tower and retail building, would begin construction in the first quarter of 2019. The 40-story tower, which is known as phase 1B, is scheduled begin construction in the second quarter of 2019. Four shorter towers, including the office tower, will surround the 40-story tower, with a public plaza in the center. In the first phase, the 40 story tower will include 406 units averaging 1,000 square feet. A shorter residential tower with smaller unit sizes averaging 625 square feet will bring the total first phase residential count to 723 units. The transit oriented development will include just 770 parking spaces in a nine-story garage, with 300 of those spaces reserved for Metrorail riders. 188 apartments will be reserved for workforce housing. LEED Gold certification is part of the conditions of obtaining approval for the taller height. $20 million in infrastructure improvements are planned, including renovation of the Metrorail station, $1 million towards the Underline, and roadway improvements. Initially I was skeptical about the dimensions of this development, but now I love it. This is exactly what Miami needs to have near mass transit. Beautiful architecture, and intriguing concept design. I like the design and generally the layout. But it’s to tall in comparison to adjoining structures. TThe canyon effect on US1 will also be strong. This is spot zoning 101 – But instead of one developer doing it in one location. Its sanctioned by another authority (not the city it’s actually in) at all locations near mass transit. I think the county should revisit this asap. Your comments don’t add value. If you don’t agree, that’s fine. But no need to belittle folks. Awww poor baby. Who “belittled” you? I don’t see any value in saying “it’s to tall in comparison to adjoining structures. TThe canyon effect on US1 will also be strong.” What the hell does that mean? That’s the thinking of a bygone era. And if the direction that the city is trying to go in brothers you, then yeah, there are plenty of little hick towns in this country you can move to where you won’t have to fear what some people are trying to do in Miami. no crime hick towns > traffic and crime ridden mongrel towns. Fresh water supply and sewage treatment plant cannot keep up with all this population density. County agencies give approval anyway because this is a banana Republic!@!@! @###$# it’s all about money here and that’s it. Well the door swings both ways so stop complaining. When you move, you become one less person putting demands on the city’s infrastructure. Someone thinking this is too tall deserves to be belittled. We need density and height in the city. It’s actually with city of Miami limits. Coral Gables is on the other side of Douglas Road. Yes, keep Miami like is 1963 again. More buildings will come to transform the areas around to Metrorail stations into little walkable downtowns. Looks like a Soviet massive building. I personally like the buildings under construction next to the Shops at Merrick Park on Ponce de Leon/ Le Jeune and US1. (Also very close to a train station). I guess it’s a matter of taste. Soviet Brutalism is highly appreciated these days. I LOVE IT!!!! Hope this happens and doesn’t get derailed. Yeah… there are still a lot of people in Miami who have to be dragged kicking and screaming into what city life is about. Millennials need to get more involved in our local government, To fight the perpetuation of the post-war Suburban mentality in Miami. This is the perfect place for this density. The county spent a lot of money on the metro rail. If you want that investment to payoff then you need to place your highest density development surrounding the stations. I agree – but I wish someone would power wash the inside of all the trains… the smell of pee pee is overwhelming in some of the cars. Metro Rail stations have no bathrooms so bums just pee right in the trains. Also the stations are not handicapped accessible elevators hardly ever work. There is no protection from the elements 4 people who have to use the buses along US1 South of the Metrorail station at Dadeland. Canopies were blown away as a result of Hurricane Irma and never replaced by the county! Tour bus riders have to stand outside in pouring rain and blazing sun waiting for buses. Metro rail is overloaded. Do you really believe that there will be room on the Metro Rail for the number of apartment dwellers living in a 40 story building with over 1400 Apartments? This County never gets it right, and you think it’s so cool to add all this density? You guys come off sounding very ignorant about environmental issues in relationship 2 density. You don’t even mention the Environmental impacts. I’ve got news for you@! So are you saying the articles about mass transit ridership being on a decline in Miami is false? So, you are saying that low population density, more cars, and less mass transportation will protect the environment better. I love dense the area around Douglas metro station become and how it’s going to become denser. Imagine if the metrorail was expanded and all the projects that could be developed around the new stations. I’m confused on how this is the biggest development in Miami history, will this be bigger than Brickel City Center, Midtown, or World Center? if so that’s pretty huge and the renderings are misleading. No.. the Miami Herald was trying to start sh*t when they found out that TNM had beat them to the punch on reporting this. How in the hell can politicians in this city be “caught off guard?” Are there just a bunch of manikins sitting in chairs in offices and city hall while the real people just sit back at home collecting a paycheck? No wonder a lot of people call this city a “THIRD WORLD” country. You are so miss informed. This project falls in the County’s Rapid Transit Zone. Thus even though it is within the city of Miami limits, it falls under the jurisdiction of the county. As such the county is reviewing under their zoning regulations. Be informed before spouting off baseless attacks. “Baseless attacks?” Who in world did I attack? The article states “politicians were caught off guard.” What?!!!! You said “it falls under the jurisdiction of the county.” So you’re telling me that a project this massive just somehow mysteriously flew under the radar of these county officials? If that’s the case, then what are they in office for? Because you attacked politicians in this “city”. Miami politicians have nothing to do with this. And the county officials in the zoning department are very aware of the project and they are processing the project under the regulations stipulated in the Rapid Transit Zone under the county’s zoning code. I can somewhat understand what it says about residents.. but politicians? You say I “attacked politicians in this “city”. What politicians? I don’t have a city governmental position or office in Miami. I’m just another average “Joe-blow” tax payer who finds it curious that the politicians we elect are that lost to even know that a developer is planning a 40 story project right under their noses and they were “caught of guard” about it? What the hell are my tax dollars paying them for then? So ugly! The Douglas Road station area has some nice buildings to look at, and frankly this would be an eyesore. A box with cluttered cladding and a nine-story parking garage right next to a station earmarked for an expansion? SAD! Ugly?.. get used to it, Arquitectonica ain’t going anywhere anytime soon. This has to be a troll bot. Posts the same comment about every building. At least use a thesaurus to add variety…. No restrooms at any Metro Rail stations. No wonder people piss in the trains. Some people just can’t hold it. How about poor disabled people? Elevators at some Metrorail stations hardly ever work. How are people in wheelchairs supposed to get up the escalator? You want all this density in the county that will never be able to retrofit the entire County. They can’t even put canopies at the bus stops where people have to wait out in the pouring rain or the blazing hot sun for buses to show up and of course there are no restrooms! In spite of all the malfeasance, corruption, and ineptitude you think it’s so cool to facilitate Unlimited population growth? and we like them big and huge. Has anyone studied the traffic impact of this project – 1,400 units and 700 parking spaces?